One of those moments that can describe meaning of the Japanese word – Yugen. When spell-bounded eyes tries to capture frames that they can not. (we tried but… how a man made Camera can capture something that eyes can’t !). It was late August in Ladakh, Himalayas. The barren lands on the way of Kang-Yatze trek in Markha Valley. .. it was just a tiny view of vast Himalayas. …nothing but barren landscape of a desert, freezing cold air, all luxuries and networks left miles away, with hardships and challenges of trekking, it was definitely not the coziest time. But it was one of those moments that create a permanent and special place in memories of viewers, that no luxury can. The kind of moment when you ask yourself – “what it is worth for? what is this special feeling? what do you get doing such things (challenging treks)?”. You don’t get a definite, explainable answer but you hold your breath and somewhere deep within, you understand what it is. You understand what things of beauty is …and you feel silently with a smile – “you will have to do it to feel it”. A feeling and sense of accomplishing something which doesn’t give any valuable practical result but… something that can only be felt ! 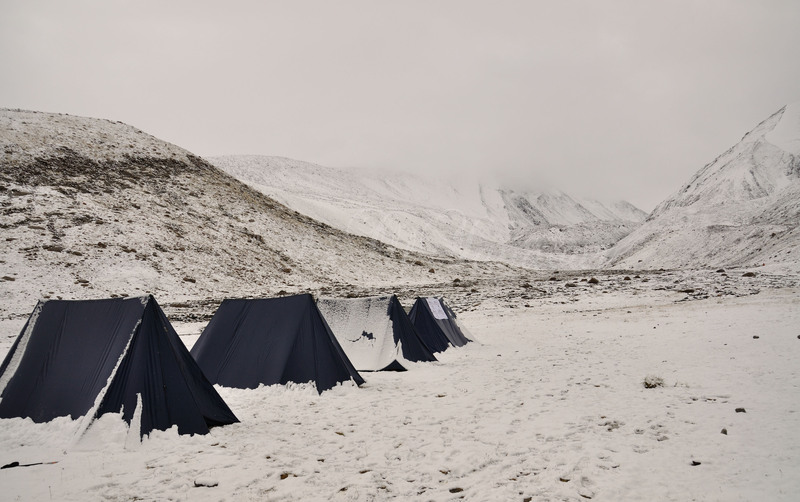 The base camp was also a barren deserted land in evening but next morning everything was covered with an untouched whiteness. It was One of those mornings, you wake up and realize the beauty and miracles of nature ! *Yugen translates to – an awareness (of the universe) that triggers emotional responses too deep and mysterious for words. A word to describe something that words can’t ! See you again next week ! 03 Nov	This entry was published on November 3, 2013 at 5:35 PM. It’s filed under Himalayas, India and tagged Himalaya, Kang-Yatze, Ladakh, MarkhaValley, Nimaling. Bookmark the permalink. Follow any comments here with the RSS feed for this post.